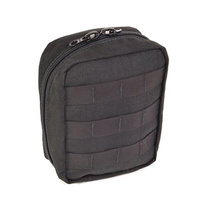 The Mini Modular EOD Pouch is a smaller version of the modular EOD Pouch. It's "clam-shell" zipper opens completely to grant the user full access to 6 internal pockets. The pouch is perfect for carrying an IFAK or similar kit. Perfect for a GP or admin style pouch also.